The Thermenregion consists specifically of a northern and a southern area. While the northern area represents a submontane stage of the eastern edge of the Alps in Lower Austria, the southern area opens as a flat or gently sloped terrain that belongs to the Vienna Basin. This correlates with climatic and geological differences between the two areas. It is no coincidence that more white wine varieties are found in the north and more red wine grapes in the south. The vineyards are located between 210 and 450 metres a.s.l. (690 – 1480 ft.). 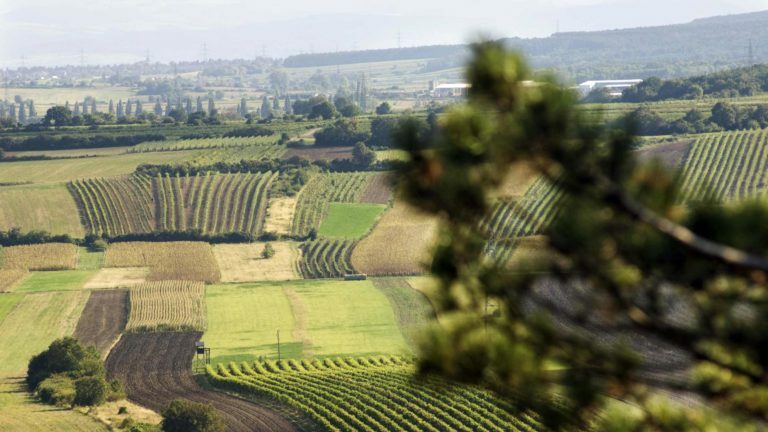 The vineyards along the slopes of the Anninger Mountain face predominantly east, southeast and south allowing vines to be pampered with sunshine. Hills and knolls planted with vines mark a landscape that otherwise has a valley-like topography. The prevailing mesoclimate favours the production of exceptional wines. The average yearly temperature during the vegetation period from April to October is 9.9 °C (49.8 °F). 1,800 sunshine hours per year can be counted and the average annual precipitation is around 615 mm (24.2 in.). Combined with the latitude 48°20’, these climatic data categorize the Thermenregion as a cool climate area and put it in company with French regions like Loire, Champagne and Burgundy as well as with Germany and Switzerland. The Vienna Woods and its Anninger Mountain (675 metres/ 2,200 ft.) and the Lindkogel Mountain (847 metres/2,780 ft.) are significant barriers that protect the Thermenregion from strong west and northwest winds. Vines simultaneously enjoy the advantages of a marginal climate. Typical for this are large temperature fluctuations between day and night. Sufficient sunshine hours during the day promote the formation of sugar in grapes, while the cool evening winds from the Vienna Forest, or the Alpine foothills, enhance the preservation of crisp fruit and acid. Slope locations increase airflow and minimize the threat of frost. Also relevant for viticulture is the moist air masses that typically come from the west have already emptied their rain in the Alps. Persistent movement of air allows grapes to dry rapidly after dew or rain. The attributes are predestined for the Thermenregion’s typical grape varieties and allow them to thrive splendidly in a fairly dry climate.